GOSH!About: Feature – A Sickle Cell Warrior’s Story I – GOSH!About: Fashion. Art. Music. Events. TV. Non Profits 'N' Lifestyle > Subscribe now! I am so proud to start this monthly feature here on GOSH!About. To bring much needed awareness to a cause thats so dear to my heart, called A SICKLE CELL WARRIOR’S STORY. This Feature will be about sharing the stories of many survivors living with Sickle Cell Anemia today. We will get a behind the scenes view of their daily lifestyle and see how they balance it living with Sickle Cell Anemia. In this first feature I’d like to introduce the founder and CEO of Sickle Cell 101 (http://instagram.com/sicklecell101 ) Cassandra Trimnell, who is diagnosed with SS, Sickle Cell Anemia. GOSH!About: Thank you Cassandra for joining me today and for sharing your story with our GOSH! Readers. Cassandra T: Sure! Thank you for having me. GOSH!About: Where are you from? Cassandra T: I was born in Iowa; then moved to California at age 15. GOSH!About: What do you do for a living? Cassandra T: I am the founder of Sickle Cell 101, an organization geared to bringing awareness to the Sickle Cell Disease. After going to University and becoming a new mom, I began this organization with a Monthly Newsletter. I hope to go back to school for Genetics Studies. GOSH!About: What type of a food diet do you eat? Cassandra T: I drink as much water daily. I’m very big on taking vitamins everyday. But, I want to incorporate more healthy eating habits into my life. GOSH!About: When did you find out you had Sickle Cell Anemia? Cassandra T: I knew from a very young age, as a baby, that I had this disease called Sickle Cell. GOSH!About: How did your parents feel or coped with you having Sickle Cell Anemia? Cassandra T: With me, they were not very surprised. My mom was big on educating themselves and me on the illness. To learn and be proactive in knowing how to take care of myself. GOSH!About: Are you the only family member with Sickle Cell Anemia? Cassandra T: I am the oldest out of 5 kids, and my younger sister also has SS. GOSH!About: Describe what a day is like for you? Cassandra T: For my particular SS, I only am admitted into the hospital once or twice a year for a severe pain crisis. But mostly, I have mild pain crisis that I am able to care at home. My AB was removed from my right hip as well. My sister, on the other hand, frequents the hospital almost on a monthly basis for severe pain crisis. And she has SS too. It goes to show we may be diagnosed with the same illness, but it effects us so differently. GOSH!About: What are some things you’ve experienced living with Sickle Cell Anemia? Cassandra T: I’ve seen how it can effect other people. I have very supportive friends and family. My husband is very supportive also. GOSH!About: Tell us 3 words that best describe you. Empathy- Understanding where others are coming from, and may experience. Hardworking- I really push myself . Im a perfectionist. GOSH!About: Final question. What would you say to help uplift and encourage Sicklers reading this article today? and What would you say to those who have never heard of Sickle Cell Anemia until reading this article? Cassandra T: To those with Sickle Cell, to take each day at a time. Be patient with your body. To pursue eating healthier foods. Such as switching one food item out for a healthier choice. To those who do not have or know about sickle cell, to go and learn something about the disease. Educate yourself more about it ; and get tested for SS and/or any other genetic disease. It was such a pleasure meeting Cassandra , and doing this interview. She is so fun, energetic and outgoing person. I look forward to doing some collabs together in the near future. 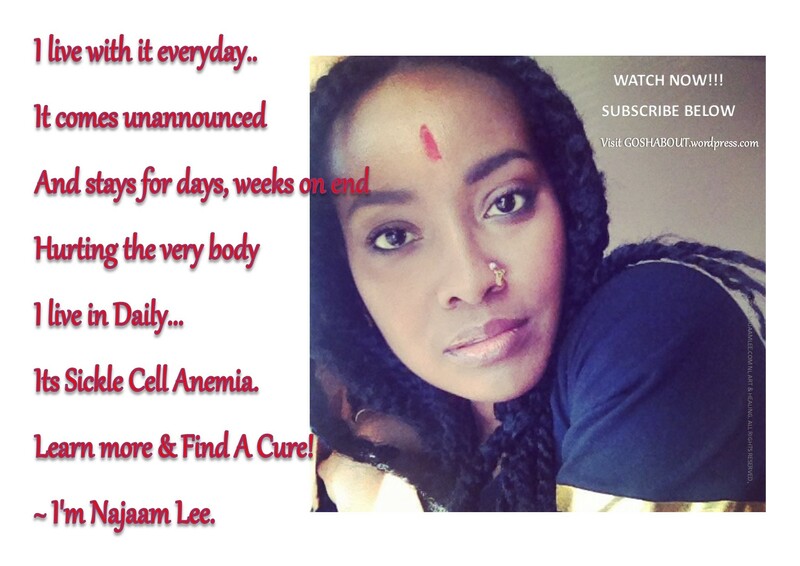 Please follow us both on Instagram.com @NajaamLee and @SickleCell101 . The more support we recieve, the more we can do for Sickle Cell Anemia. We may have the same disease but we all have a story to tell. I hope to bring you a video interview with Cassandra next time. *** If you are living with Sickle Cell Anemia, and are bringing awareness through your organization and desires to share your story please email Najaamleestudios@gmail.com in subject line ” A Sickle Cell Warrior’s Story”. Please LIKE and SHARE this article to Family – Friends & Fans!